Dr. James Garvin and M.S. Beach built this cabin in 1859. 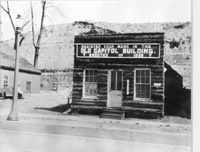 Photograph of Cabin at its original location. Today's 2516 West Colorado Avenue. Since 1961 it is in Bancroft Park, 2400 West Colorado Avenue. Just like their Native American and Mexican American predecessors, Anglo-Americans who immigrated to the American West used the surrounding environment to build homes and communities. As Anglo-Americans began settling in the Pike's Peak region in the late 1850s, the settlers built log cabins, usually consisting of log walls and dirt roofs and floors. The logs came from nearby forests of pine trees off of Cheyenne Mountain and the forests along the Divide. When town founders like M.S. Beach and Charles Persall built the first cabin in Colorado City in August 1859, the two men cut the timber from Cheyenne Mountain and hauled the logs down to the town site. Without a sawmill to cut the lumber in uniform sizes, the early settlers, like Beach and Persall, had to "whip-saw" the logs to build doors, door frames, and window frames. According to Irving Howbert, an early Pike's Peak region settler, "whip-sawing" was a method where two men "placed a log horizontally on trestles eight to ten feet high." With the saw having handles at each end, one man would stand on a "platform and the other on the ground." Not only was whipsawing slow, but this method did not produce even or uniform shaped boards. After laying the cabin logs high enough for the walls, early settlers would use a large ridgepole for the center of the cabin roof, extending smaller poles perpendicular from the ridgepole to form the roof and eaves. Because the settlers would cover the poles with pine boughs and then shovel eight to ten inches of dirt and gravel over the top, Howbert recalled that this type of roof was efficient during good weather "but was rather inefficient in a heavy or long-continued rain." In the same way that early settlers used materials from the environment to construct the exterior of the cabin, the settlers also used available materials to construct household furnishings. Settlers used poles and split logs for furniture and small stones and rocks for fireplaces. As more and more Anglo-Americans settled in the Pike's Peak region, the settlers needed a sawmill. Messrs. Smith and Finley responded to the demand and built the first sawmill in the area near Eastonville, using lumber from the Black Forest on the Divide. Early settler Anthony Bott recalled that Smith and Finley's sawmill supplied lumber to the residents of the Pike's Peak region for many years. With an operating sawmill in the area, settlers no longer had to rely on whipsawing alone to cut the lumber.